The Wellsville, Addison & Galeton Railroad was a surviving fragment of the long-defunct Buffalo & Susquehanna Railway. Originally begun as a collection of logging lines, it eventually developed into a coal-hauling, standard gauge railroad connecting coal mines in the DuBois, Pennsylvania area with Buffalo, New York. Severe grades (including switchbacks) led to the road's eventual reorganization in 1914 and acquisition by the Baltimore & Ohio in 1932 (the link to Buffalo was pulled up during World War I for scrap). A 1942 flood broke the connection with the B&O south of Galeton, Pennsylvania and the remainder was operated as the B&O's Wellsville & Addison Subdibvision. 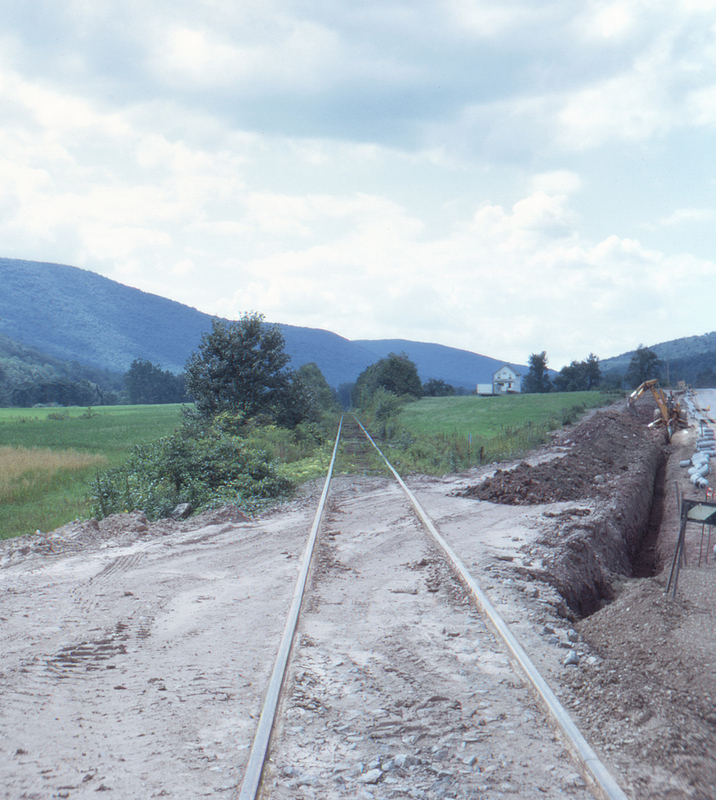 By 1955 the road had been cut back to an arc connecting Wellsville and Addison, New York via a dip south into Pennsylvania to Galeton, with a short connection to Ansonia. It was in this form that the B&O sold what remained of the former B&S to the Salzberg family interests (for all of $250,000) who renamed it the Wellsville, Addison & Galeton. By 1970 Ansonia, Pennsylvania was the only eastern connection for the WA&G where it interchanged with the New York Central's Fall Brook Line. The weeds may be springing up between the rails but it's still evident that flanges have recently left their mark in the construction mud in the foreground. Apparently the U.S. Route 6 grade crossing is undergoing much-needed repairs. This page posted 3/1/2018; revised 1/1/2019. Text and photo ©2018 Lamont Downs.